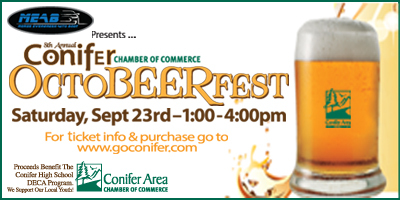 Conifer's OctoBEERfest sponsored by Morse Evergreen Auto Body at Brooks Place Tavern. Come out and enjoy beer tastings from over 15 breweries, snacks door prizes, games and more to support our the DECA program at Conifer High School for the next generation of business leaders. In the courtyard next to Brooks Place Tavern. Tickets are $25 an can be purchased online by CLICKING HERE, at Brooks Place or at the event.